When you are trying to start a family, you want to give your conception attempts the greatest possible chance of succeeding. Clear Blue Ovulation Tests make it easier to identify your most fertile days, potentially offering the best chance of getting pregnant naturally. 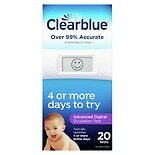 Clear Blue's easy-to-use products can give you more control over the conception process. How Do Clear Blue Ovulation Tests Work? Clear Blue Ovulation Tests look for the presence of luteinizing hormone (LH) and estrogen (estrone-3-glucuronide or E3G) in your urine. A huge surge in the LH hormone occurs between 24-36 hours before ovulation. Testing for both LH and E3G gives women information on not only the 2 days of peak fertility, but also up to 6 days of high fertility. The day of ovulation and the day before are the times when a woman is most likely to conceive, but with the dual approach to fertility women can rest assured they are getting the most information available. 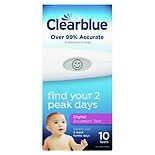 Using Clear Blue Ovulation Tests around the middle of your cycle can help you to pinpoint exactly when your most fertile period occurs, so you can make the most of this opportunity to make a baby. 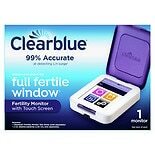 Clear Blue Ovulation Tests are designed to be easy to use and easy to read. Simply remove a testing stick from its wrapper and insert it into the test holder, which will let you know when the test is ready to use. Hold the absorbent part of the testing stick into your urine stream for a few seconds, then lay the test flat to give it time to work. Within three minutes, you'll know whether today is a day when you should attempt to conceive. Although every woman hopes to get pregnant as soon as she chooses to start a family, the reality is that many couples take several cycles to conceive. Clear Blue Ovulation Tests can take the guesswork and frustration out of this process. 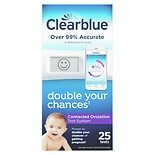 You can use a Clear Blue Digital Ovulation Test over and over again, simply by inserting a new testing stick each time. 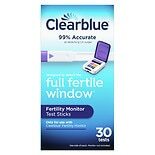 If you want to take even more control over your conception process, then choose a Clear Blue Fertility Monitor. This device not only pinpoints the day of ovulation, but also gives you an indication of your level of fertility on each day of your cycle. With the help of Clear Blue, you can adapt your schedule to maximize your chance of creating a new addition to your family.